A RECIPE! I promise I’m gonna try ya’ll. Last year was full of transition. This year shouldn’t be unless God wants to send the bearded, huggable, Jesus loving man I always ask for, and there would be no arguments there! Therefore I should be able to establish some writing, posting, taking pictures of food (oh wait, I never stopped doing that) patterns. 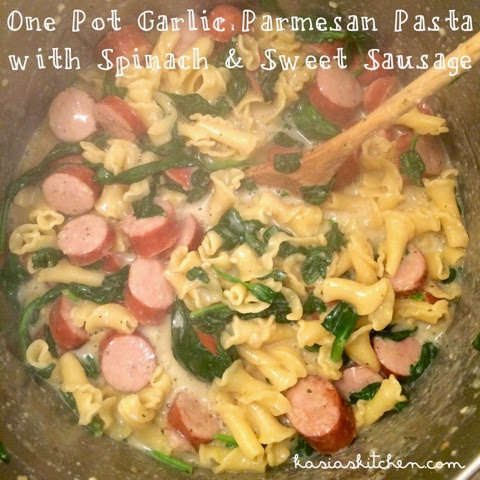 Kinda sorta made this dish up for last night’s dinner, and it was a hit! 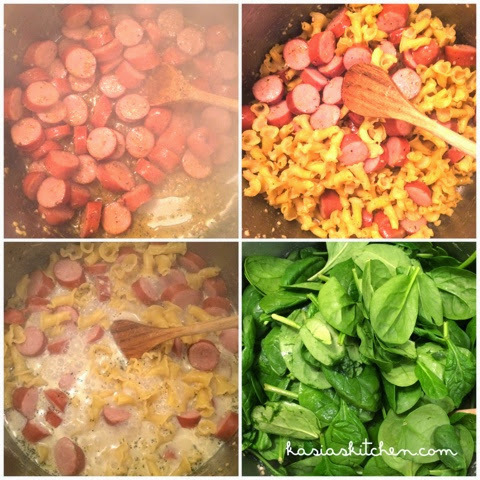 The roommates loved it, it’s pretty healthy for a creamy pasta dish, it was REALLY filling, and it was EASY! I see a new obsession coming with one pot concoctions. Heat olive oil over medium high heat in a big stock pot (you’ll need it to be high for when you add the spinach). Add garlic and saute for 30 seconds or until fragrant. Add sliced sausage and saute until browning on the edges. Add all seasonings to taste, probably a teaspoon of each is what I did if I had to guess, maybe a little more for the salt and italian seasoning and a little less of the pepper. Add butter and stir until melted. Add pasta and let it get coated in the yummy stuff. Add milk and broth. Increase heat to high and bring to a boil. Boil for a couple of minutes then reduce heat to medium low. Should be softly bubbling just at the surface. Stir frequently and let simmer for 18-20 minutes or until pasta reaches desired al dente consistency and sauce is thickening. Add parmesan and stir until combined. Add spinach and stir until wilted and combined. DONE! Dinner in 30 minutes. *How about a MyFitnessPal recipe calculating tip! It’s SO easy to put recipes into MyFitnessPal to figure out calories/track them. If you find a recipe anywhere online, you can actually put the link into MFP from the web or from the app. From the web: on your dashboard page click food, then recipes, then copy and paste the link into recipie importer. You can take away the ingredients you aren’t using, change ingredients like 2% milk to skim milk, and add ones you are, change serving size, etc. From the app: click more, my recipes and foods, the add symbol in the top right corner, then add from the web. You can do the same adding and changing from the app. You can also start from scratch in both and make your own recipe. In the app you can even scan the barcode of the exact ingredients you are using. Just make sure for all ingredients you select the correct portion size, like for pasta in this one I had to select whole container. IT’S SO EASY!